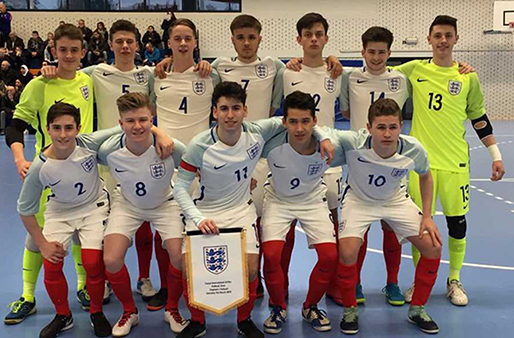 The England U19 Futsal squad will head to France in August to compete in a Four Nations Tournament. Following a successful year of development, the Young Lions will travel to Montaigu and compete at the Complexe Sportif Max Bossis Arena on 28 and 29 August. Up against well-established Futsal nations France, Spain and Montenegro. They will play an opening semi-final and either a final or third place play-off game. The Young Lions aim to build upon the success from their debut international double-header earlier this year, where they completed back-to-back victories against the Netherlands, and will be hoping to make a similar impact on this tournament, despite being one of the newer teams. “This will be a huge test for our players and will allow us to naturally benchmark ourselves against top Futsal nations who have a strong Futsal heritage,” said U19s head coach Pete Vallance. As the game continues to grow in England, The FA are developing a strong and sustainable elite youth pathway. Many of the squad that faced the Dutch will feature in the tournament, with a few new call-ups including Kai Bone, Tom Doar, Raul Radulescu and Drew Hodgson.